Our Galapagos Cruises combine a contemporary design, privacy and comfort all within the marvelous setting of the Galapagos Islands. The Galapagos Sea Star Journey has a capacity of up to 16 passengers, featuring seven spacious Galapagos Suites – Matrimonial (approx. 25,2 m) and one Sea Star Suite (approx. 35,2 m) equipped with panoramic windows to enjoy the wonderful landscapes of the islands. These come with a private bathroom, hot/cold water and air conditioning (with independent controls). Twin beds (or one faux queen bed) and connected suites are available for families. Local and International dishes – especially designed by our chef – are served in the cozy atmosphere of our dining room. Our yacht offers a large solarium with shaded and uncovered areas, two Jacuzzis and comfortable sun loungers. Social areas include a Saloon, mini-library and video library as well as a play zone for kids (during family departures). Snorkeling equipment and kayaks are available too without any extra charge. 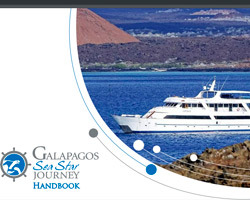 Galapagos Sea Star Journey complies with local and international safety regulations. In addition, we implement sustainable practices throughout our journey to protect the fragile environment of the Galapagos archipelago. Fine dinning & Cuisine All meals are included and served in an international style, combining natural and organic ingredients in order to offer a healthy gastronomic experience. In the case that some guest may require a special dish due to food allergies or restrictions, our chefs will be willing to adapt the menu to these requirements if it has been informed previous the trip. Naturalist Guide Our certified naturalist guide are top ranked, speaks English and have wide experience and knowledge on the Galapagos Island topics such as wildlife, geology, marine life, biology, and more. At the end of every day, visitor will be able to share their daily experiences and receive the Guide´s briefing for the shore excursions of the next day. Drinks On board the passenger will have unlimited water, tea and coffee service. Also, for an extra charge, a Bartender is available for cocktails and soft drinks. Do not forget to ask for our wine exclusive menu, ideal for the dinner or a special moment. Shore Excursions All excursions and activities are included. Zodiac rides, nature hikes, snorkeling and kayaking within the Galapagos National Park, all this activities are in company of an English speaking naturalist guide. Radio: Several consoles HF-VHF-UHF, Nactex, Distrex and handheld units.